I’ve had garage ventilation on my mind for some time now. Between Eileen and I always doing projects in the garage, we produce a lot of fumes from painting and staining. Cutting wood in there also throws a lot of sawdust into the air. 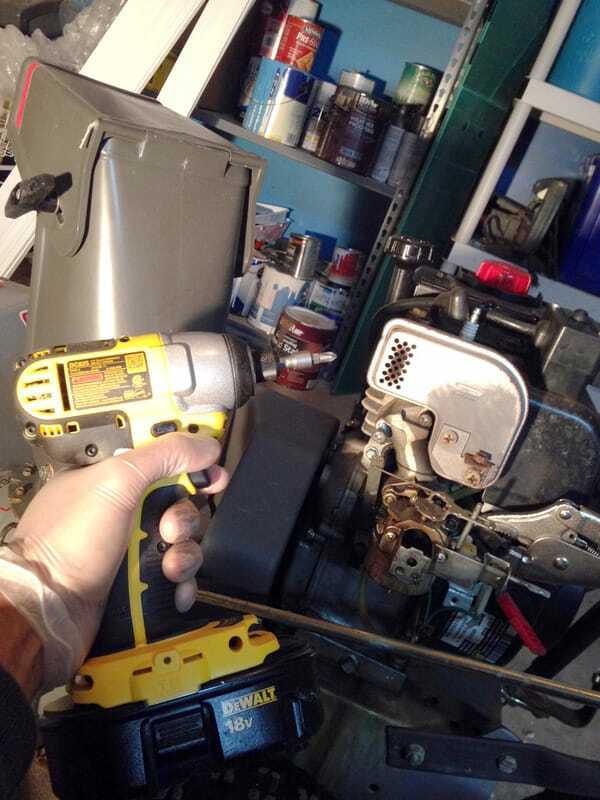 Even when I work on the mower and other small engines in there, the smell of gasoline lingers. On nice days when it’s not raining, we leave the garage door open and sometimes even put a fan to help exhaust the air. However, this was not the ideal solution. Many painting and staining projects would sit in the garage overnight filling the air with fumes, just to be aired out when the sun came up and when we can open the garage doors. Aside from the noxious odors sitting in the garage the next morning, it would also delay the completion of these projects. 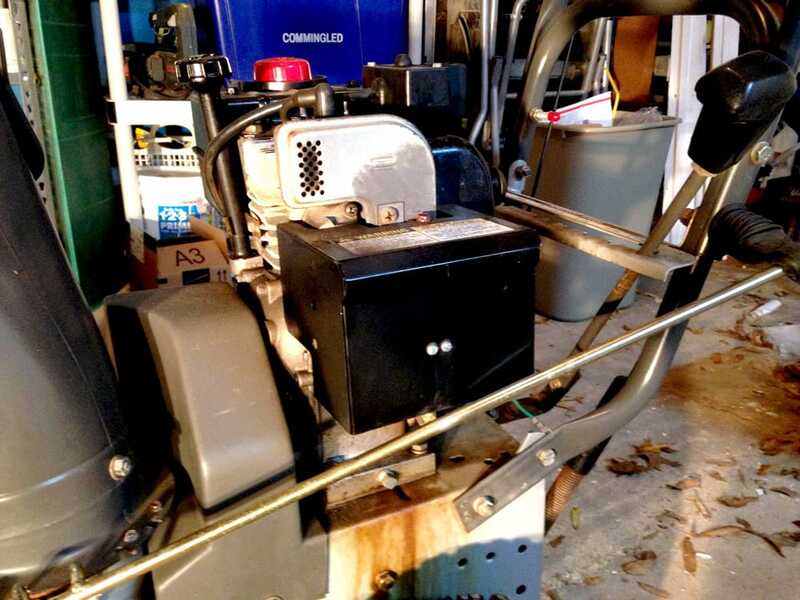 To add to the pressure, I recently acquired a snow blower for the upcoming winter snow storms, and that was bound to leave the garage filled with gasoline odors after usage. Even more reason to look into garage ventilation systems. So I put my thinking cap on and wandered around the garage looking for ventilation ideas. I knew I wanted to set up some type of fan that would exhaust the air, so I was looking for areas in the garage that would be an ideal location. In my previous home, I used to run a lot of computer equipment in the garage that would produce a lot of heat. 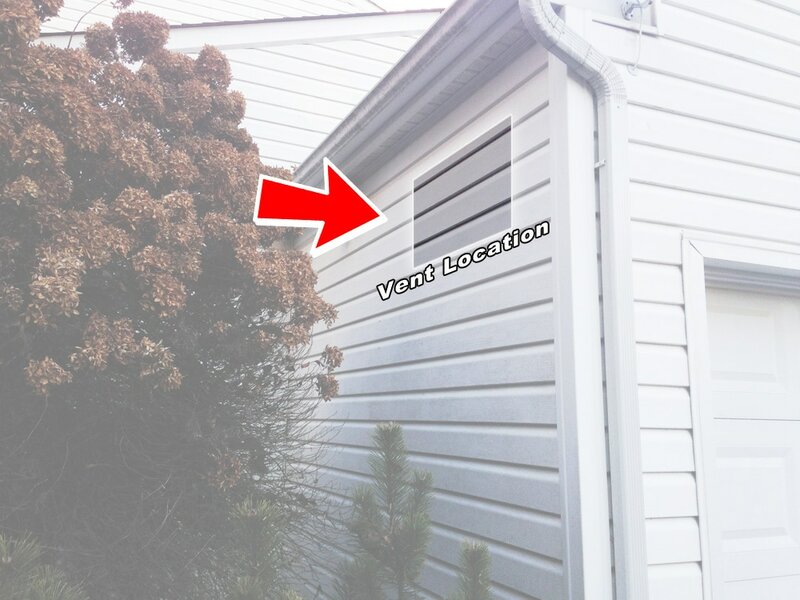 I had researched garage venting options back then and settled on a small fan and vent that could be installed directly in the garage door (via a small hole that you cut). This solved my problem of exhausting the heat, but had an unfortunate side effect. 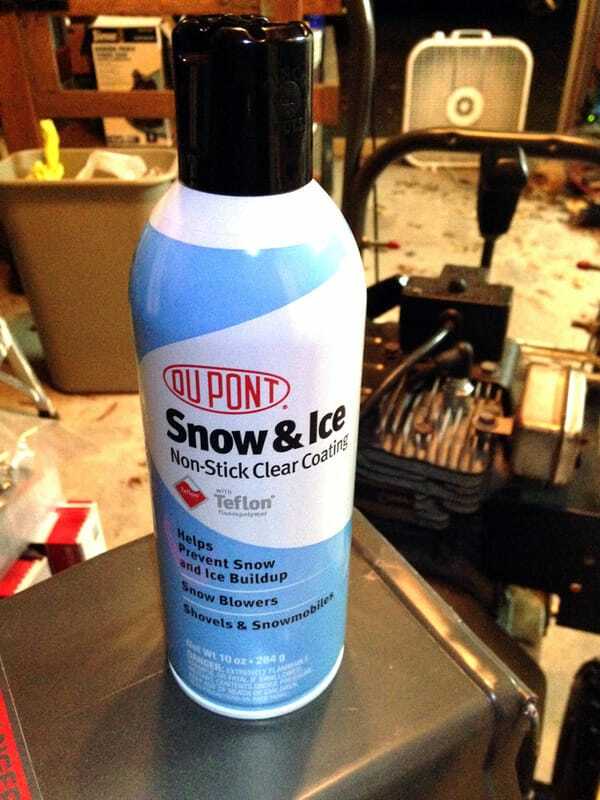 During the winter, the garage door vent would let all the cold air in and drop the garage temperature below the freezing point, wreaking havoc on my paints and other liquids that were not meant to be frozen. The garage door vents and exhaust option left a bad taste in my mouth ever since, and I was determined not to pursue that direction again. Also, to properly exhaust the size of my current garage, I would need a much larger fan and hole to make the job worthwhile. I finally settled on a way of venting the garage. 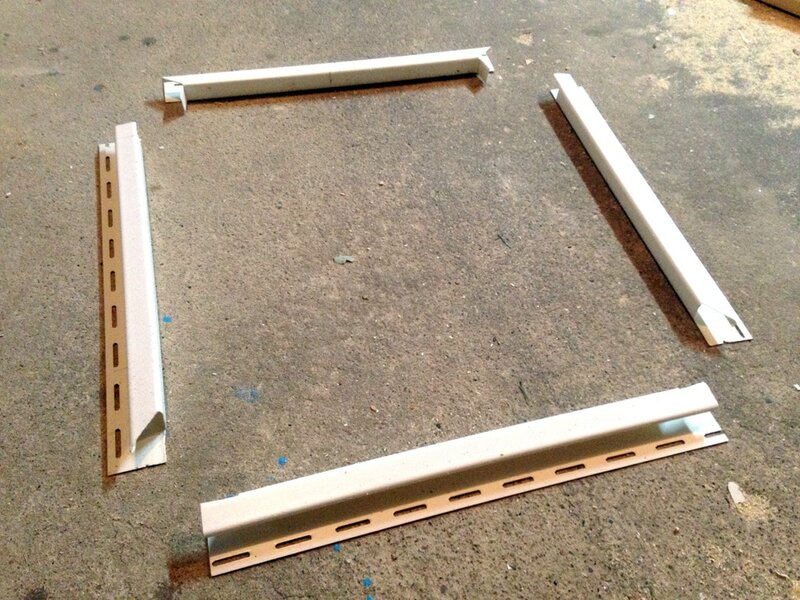 I would find an ideal venting location in the garage, and cut a large square hole in the wall (roughly 14”x14” in between the wall studs). 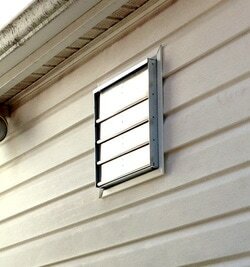 Then I would install self-closing shutter vents on both the interior and exterior of the wall. 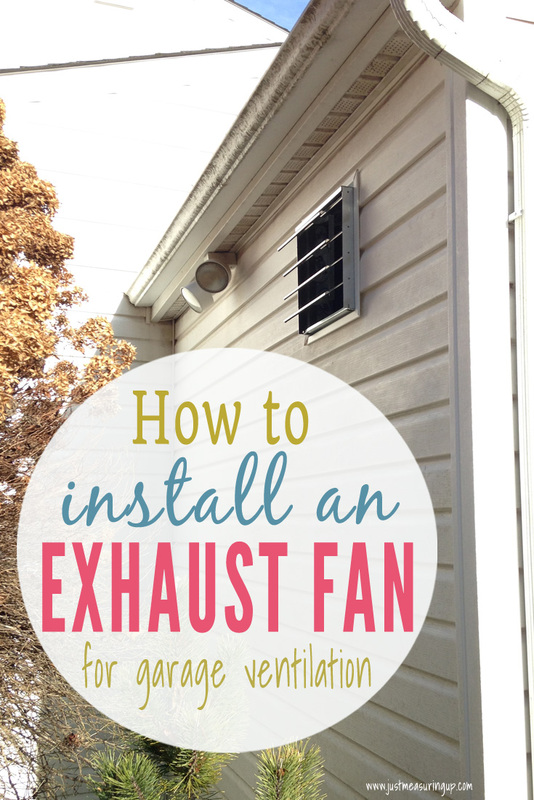 Finally, on the inside, I would install a powerful exhaust fan to ventilate the garage. 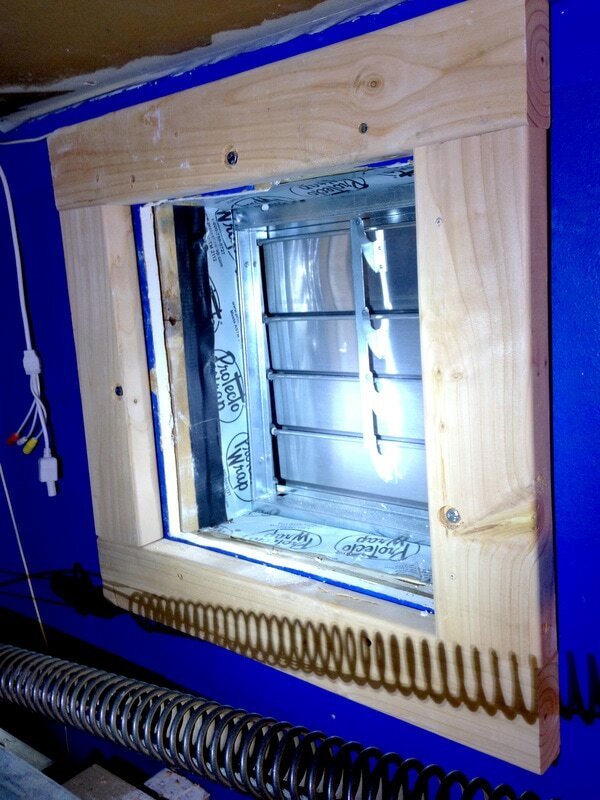 The double shutter vents were going to be key in helping to keep the cold air outside during the winter. I did a lot of research on exhaust fans and decided on one with built-in shutters. I purchased a 14” diameter fan capable of 800 CFM. No wiring was needed with this particular model because it just plugs into an outlet. I already had a wireless switch ready for it too, so I could activate it from the other side of the garage. 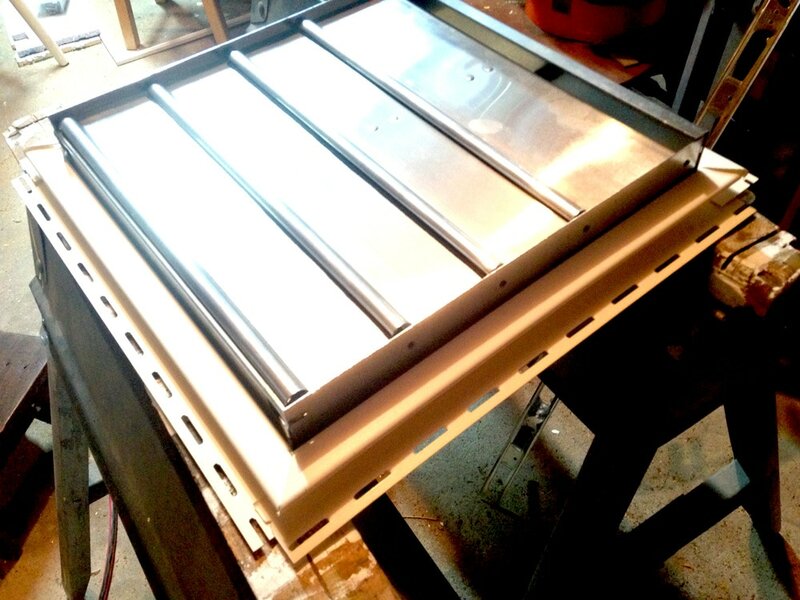 For the exterior wall, I went a 14” aluminum shutter vent. With the hardware identified, I looked for an ideal location for the vent. The best location would have been above one of the garage doors, but for aesthetics, I didn’t want the vent to be visible from the street. So I went with a wall that faced the rear of the house. It would be practically invisible but still serve its purpose. Above, you’ll see the first layer I went through was the drywall. Then I had 2 layers of insulating foam. Next was the white vinyl siding. I left this intact for now while I awaited shipment of the exterior vent. The cutout got a little rough at some of the edges, but it was not a big deal. The fan would cover all the edges, and hide any irregularities in my cut. Next, I had to seal the top and bottom edges of the hole. 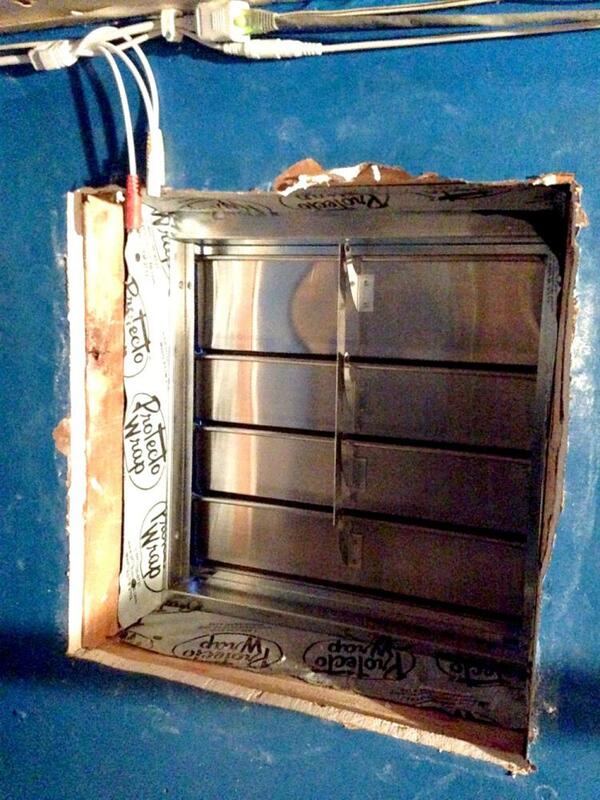 This was a necessary step to prevent the fan from venting air into the wall. I simply cut two pieces of 2x4s, inserted them in the top and bottom, and attached to the wall studs using some pocket hole screws (with the help of my Kreg Pocket Hole jig). I put temporary hooks into the 2x4s to make it easier to maneuver them. 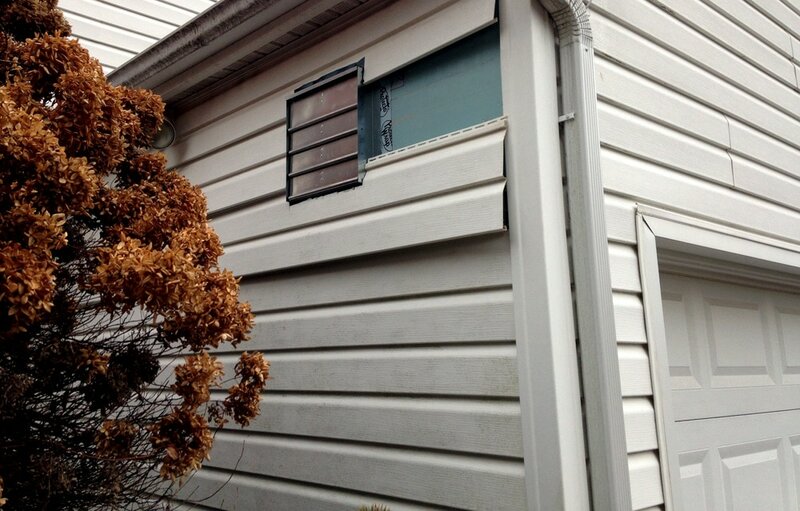 A few days later, the exterior shutter vent arrived and I resumed work on the project. 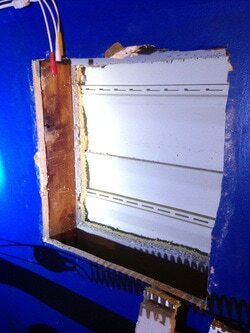 Cutting a hole through the wall meant that I had to be careful to make the exterior side water proof. I couldn’t just cut a hole in the siding, insert the vent, and call it a day. To keep water from penetrating the siding, I needed to use J channel. This would allow me to create a frame around the vent that would overlap the siding and shield the rough cut edges from water. This was actually my first time working with J channel, so I had to do some research online to see how to make the cuts on the ends (important to prevent water from seeping in). I followed some great instructions on FamilyHandyMan.com (under the section “Install J-channel around the window”). Now came the fun task of working with the siding. To properly install the exterior vent, I needed access to the wall underneath the siding, which meant removing several pieces of siding. This was a learning process as I went along (I did all my research, so I was confident in the task at hand). 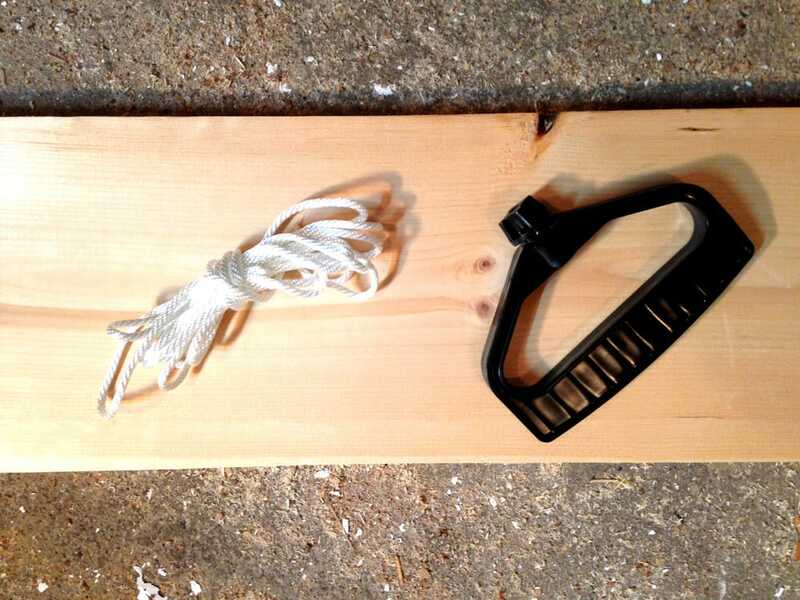 With the help of a siding removal tool, I was able to easily detach some siding, and pull it away from the wall. With enough of the siding out of the way, I was able to continue work on the hole. To help with the waterproofing, I used some flashing tape (left over from my shed project) to seal in the edges of the hole. 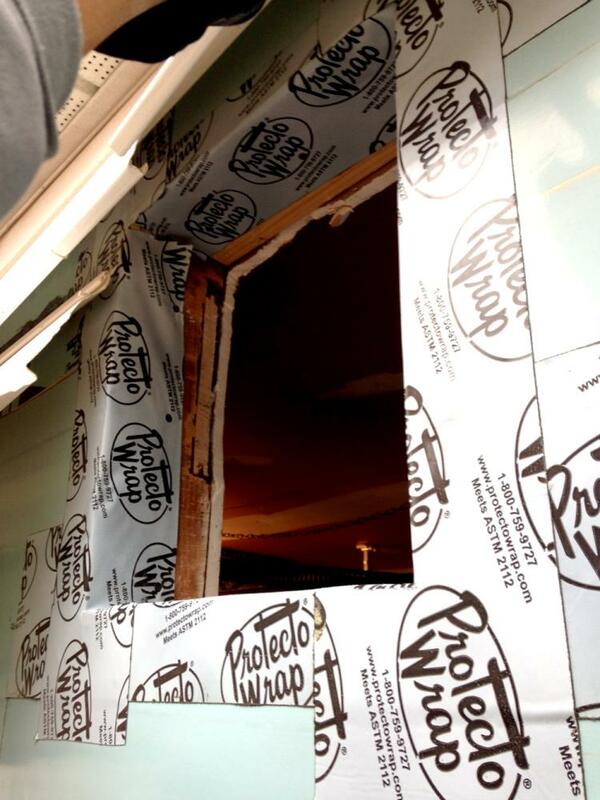 In the event that water did make its way through the siding, the flashing tape would ensure that the water couldn’t seep behind the exposed edges of the foam insulation. With the garage vent in place, I attached the J channel frame, overlapping the rough cut edges of the vinyl siding. Looks very professional, doesn’t it? It should be very water tight too. 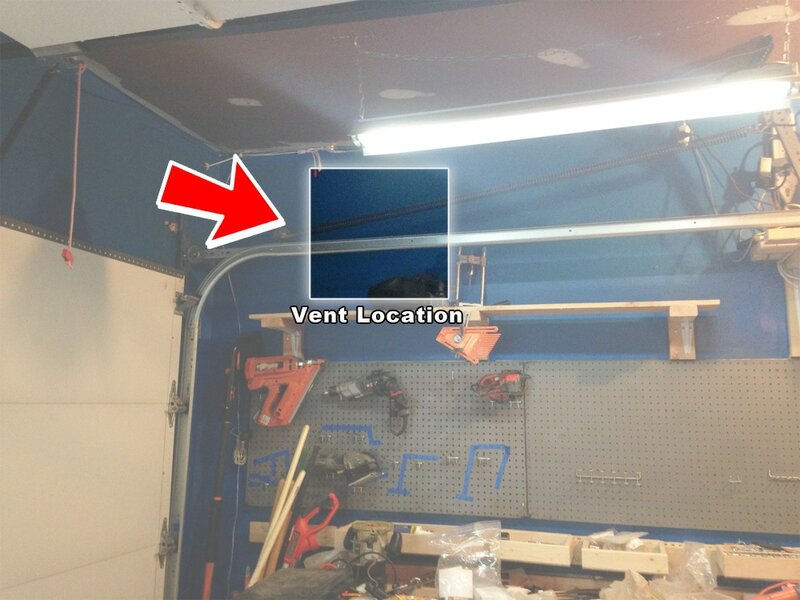 I was nearing the end of the project of putting vents in the garage. 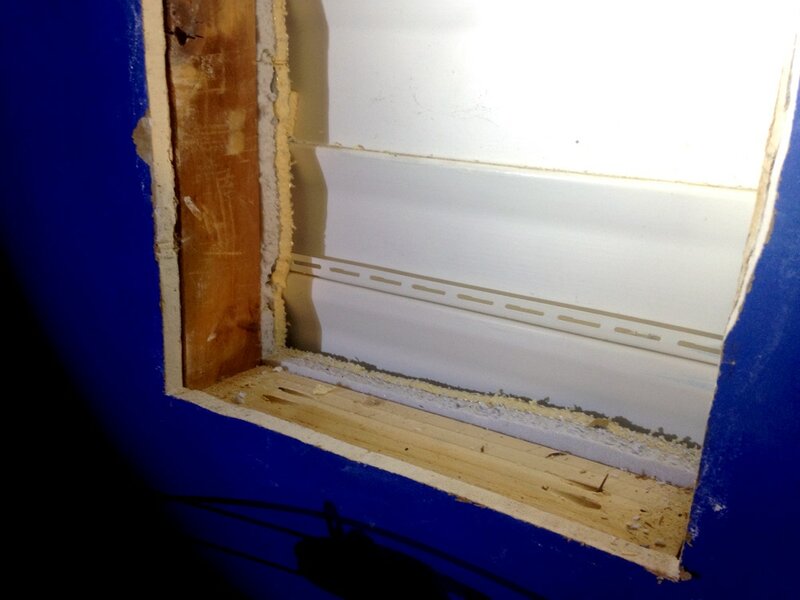 I inserted the exhaust fan in the hole and was getting ready to screw it into the studs. Then, I decided to check the vents on the fan to make sure they opened and closed properly. They opened fine. Unfortunately, they had trouble closing. They would stick on the way down and not close all the way. This was bothersome because a partially open vent meant cold drafts coming in. 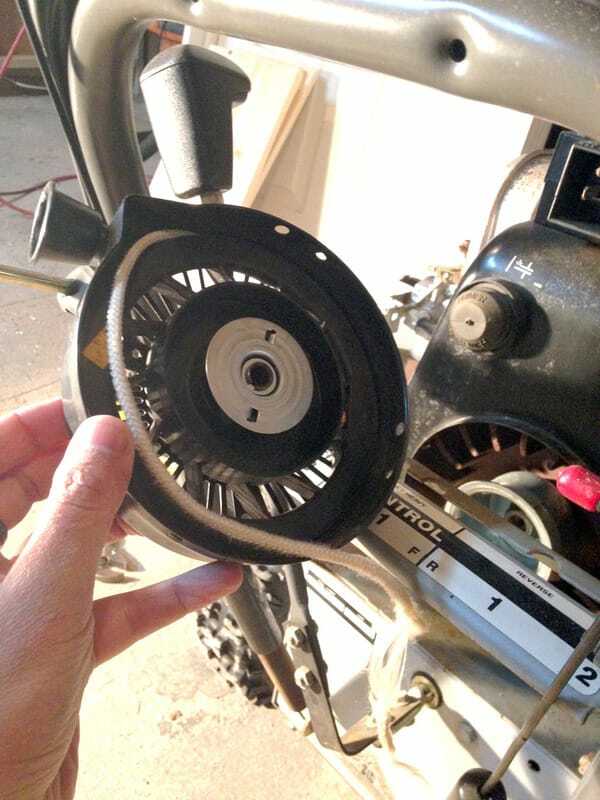 After some fiddling, I discovered that the hole I cut was too snug of a fit for the fan frame. It was distorting the frame ever so slightly to cause the shutters to not close properly. If I pulled the fan about 2 inches out from the wall, the shutters worked fine. So the solution was simple. 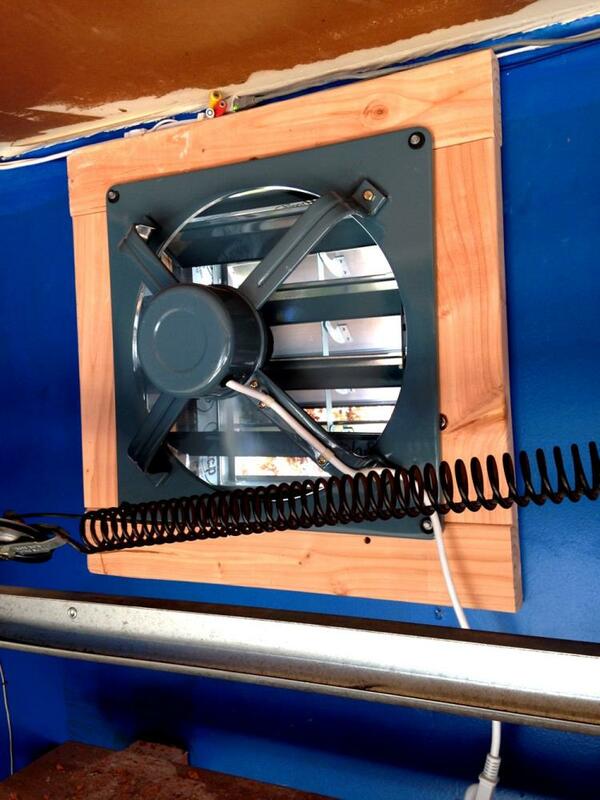 I would built a 2×4 wooden frame between the wall and the fan, to give the exhaust fan enough distance from the hole for the shutters to operate properly. I literally spent only 10 minutes on this task – I chopped some 2x4s to length with the miter saw. 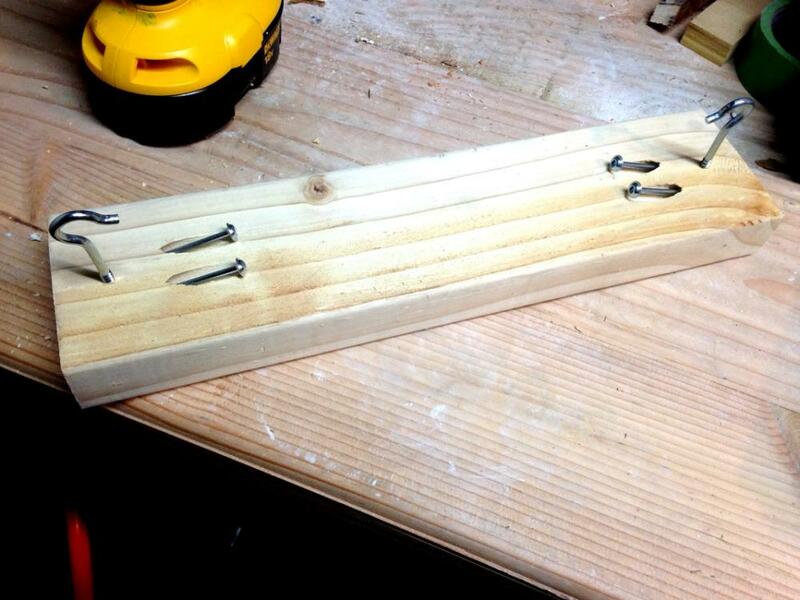 Then I attached them to each other with pocket hole screws to form a frame. ​Finally, I used some lag bolts (countersunk with a forstner bit) to attach the frame to the wall studs. 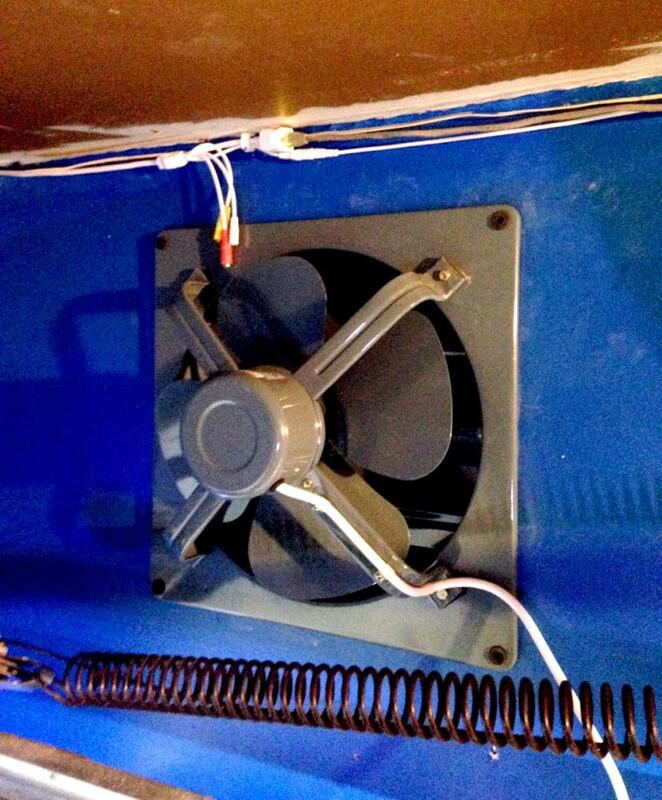 At last, the exhaust fan could be bolted to the wall. I pressed the fan against the 2×4 frame and made sure the shutters opened and closed freely. Then I attached the fan to the 2x4s with some heavy duty screws. My garage vent was now completed. I stood back, admired my handiwork and then fired up the exhaust fan with my wireless switch. 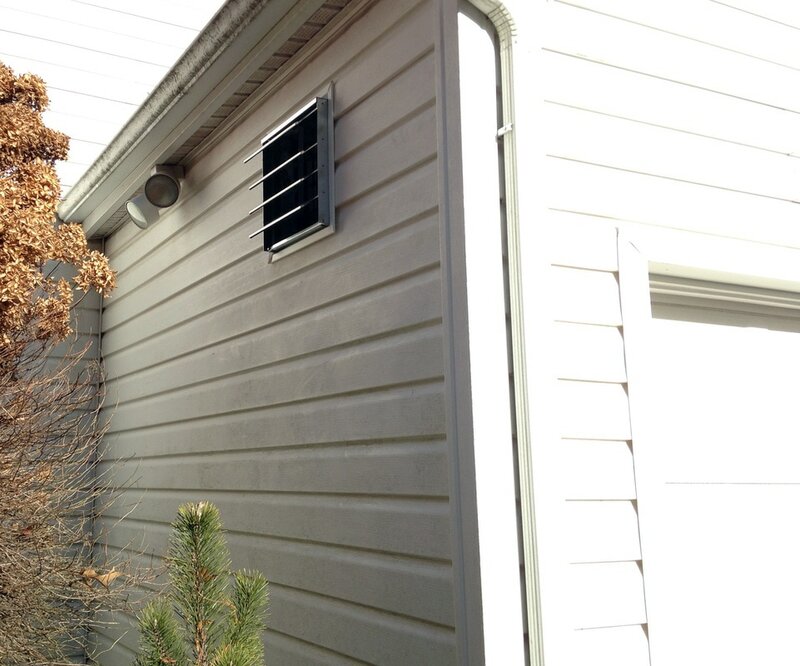 ​As the fan speed increased to full, both the inside and outside shutters opened to exhaust the garage. The fan was not that loud either (it was barely audible outside the garage). I’m very excited about our new garage exhaust fan. I already used it this past weekend with great success. 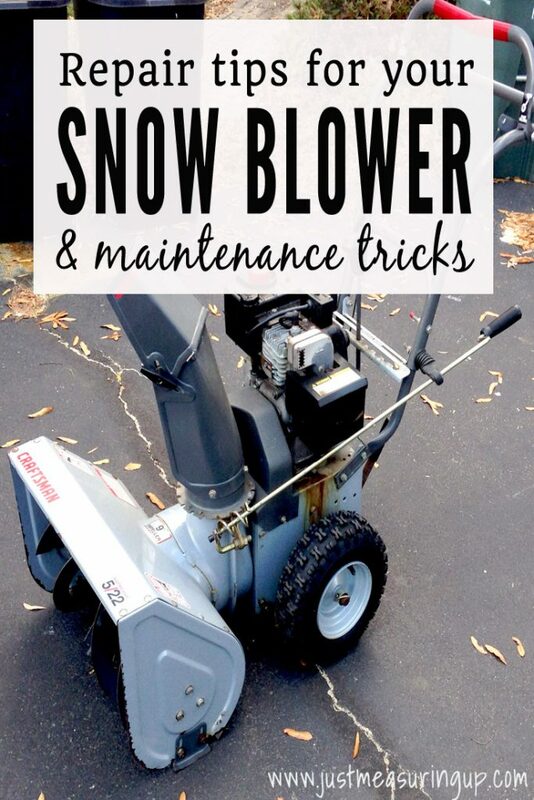 We had a mild snow shower (about 4 inches), and so I broke out the snowblower to try it out. As predicted, when I finished clearing out the snow from the driveway, and put away the snowblower in the garage, the still warm engine started to stink up the garage. I engaged the new exhaust fan for a few hours, and the garage was back to normal. 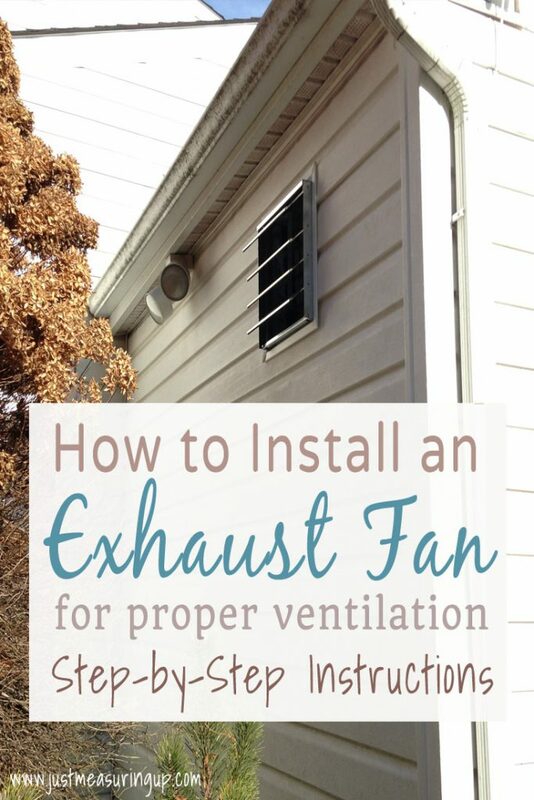 ​I can’t wait to see what the fan does when the garage is full of sawdust in the air. Total cost of putting the vent fan in the garage was around $150 and was collectively about a day’s worth of work. 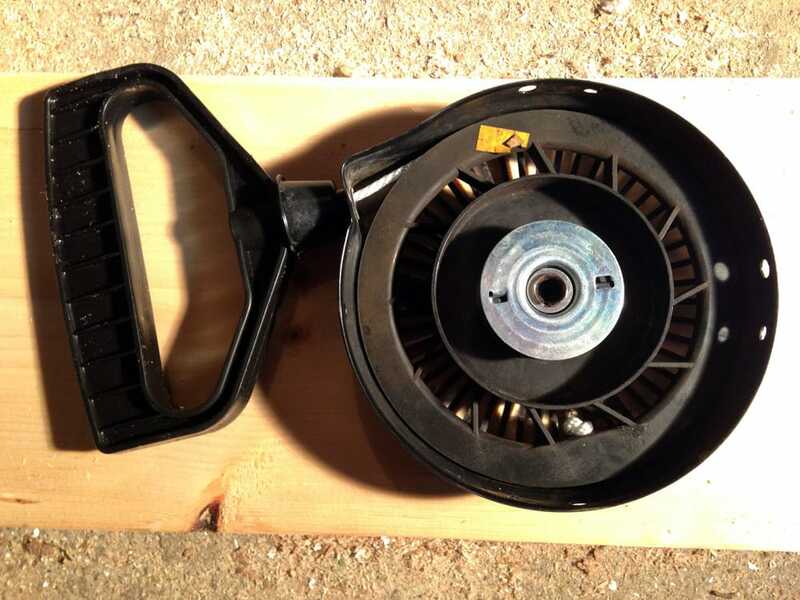 If you are in need of exhaust fans in the garage, this tutorial will have your new garage wall exhaust fan up and running in no time! I was really pleased with the garage vent fan. It runs great and really airs the garage out nicely. However, I did add on more thing to our garage vent fan. I had been manually turning the fan on and off as needed. Sometimes I left it running longer than I anticipated. So I wanted a better system of turning the fan off. I ended up purchasing an electronic timer switch and plugged the fan into it. Now, I just press a button for how long I’d like the fan to run for and it runs for just that duration. 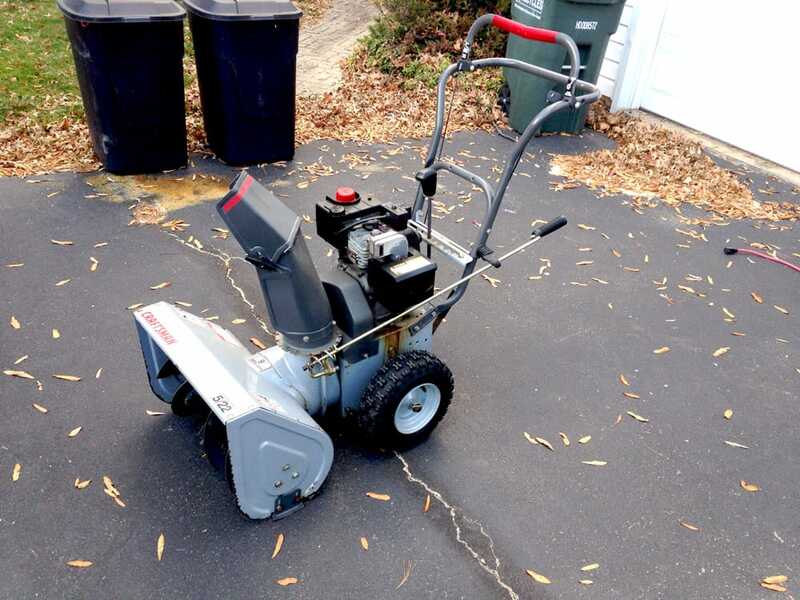 As the days warmed up and the grass started growing again, it wasn’t too long afterward when it was time to awaken my riding mower from its slumber. When a nice sunny day came, I went out back to the shed, hopped on the mower and turned the key. Nothing happened. I turned the key again, and again. It was just making a whirring sound. I couldn’t even try applying the choke because the engine was not even trying to turn over. After trying a few more times, I was dismayed. I knew I would have some trouble starting up the mower after the winter break, but not like this. It was clear that today was not the day for mowing. It was time to do some investigation and perform some mower maintenance. 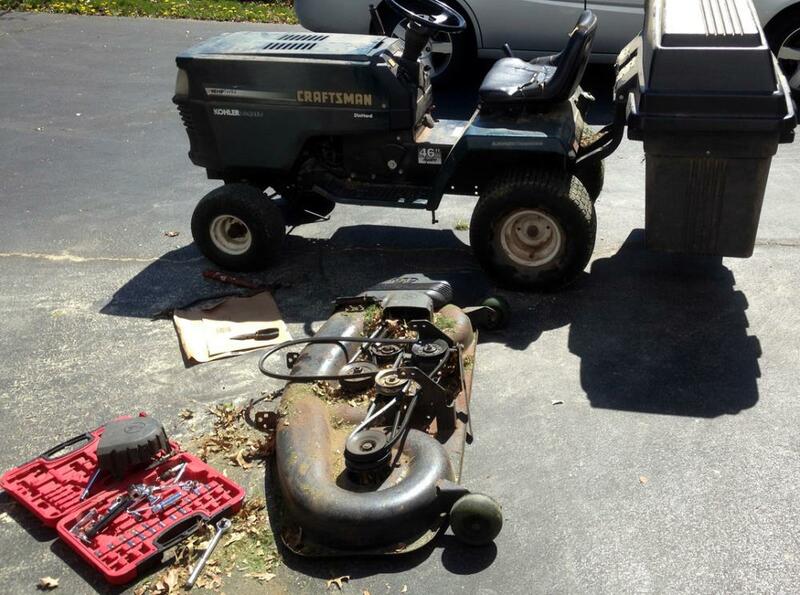 I bought the used riding mower on Craigslist last summer. I got a great deal because it was 20 years old and was showing a lot of cosmetic wear. However, the previous owner kept up with the maintenance, and it ran pretty well for its age. 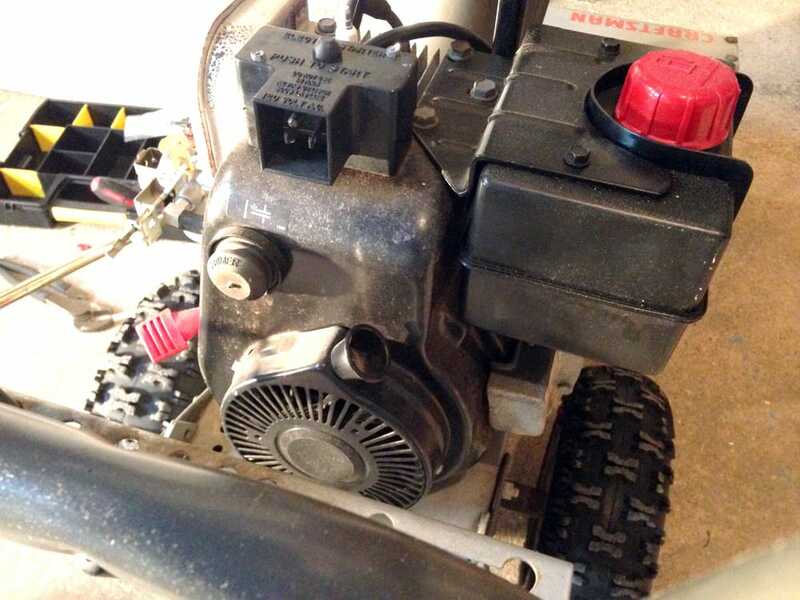 I was also not too of how to fix a riding lawn mower because I had confidence in my repair skills (having brought some old push mowers back to life at my previous home with some replacement parts). To prep for my maintenance project, I tracked down the mower manual online, located the consumer replaceable parts and ordered them online. 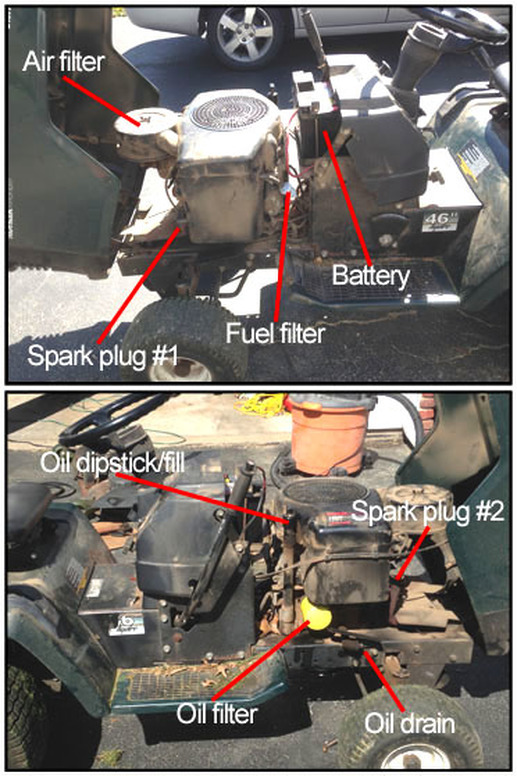 Then I put together Ash’s grand maintenance plan for reviving your riding mower, as outlined below. The first thing I did was check for activity in the spark plugs. Using a special spark plug socket, I pulled one of them out, still connected to the battery, and turned the key. There was no spark. 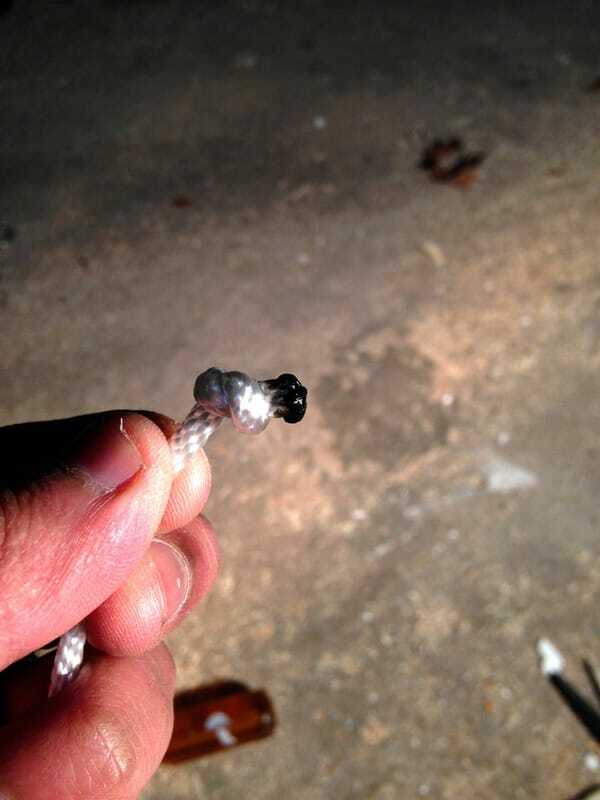 I tried another spark plug that I knew was working (from my push mower), and still no spark. This led me to believe the battery was low on juice. I had a 12 volt car battery charger, so I was going to try recharging it. 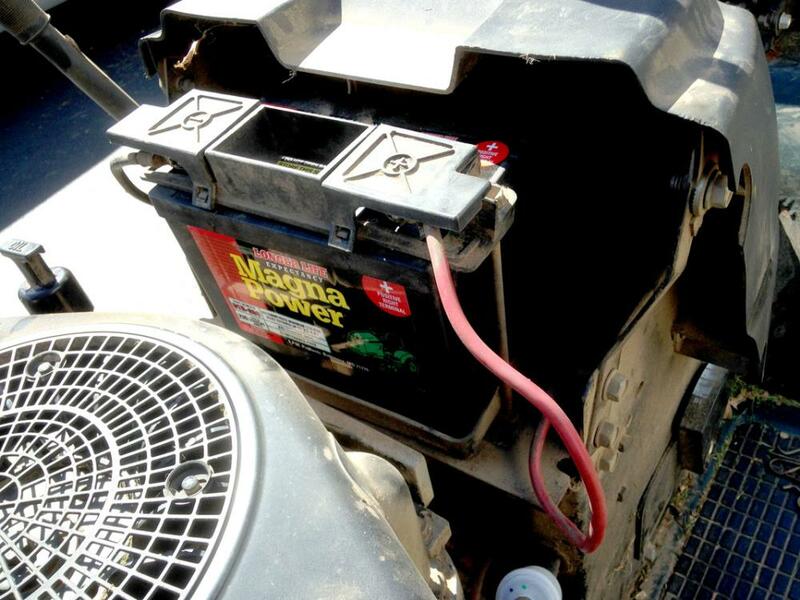 It made sense that the battery would be low as the mower had not been run for a few months. Before I recharged, I wanted to rule out a bad battery (incapable of being recharged). I tested the battery with a volt meter and got 12.4 volts which was actually normal. Any lower readings (especially in the 11 volt range) would have suggested a bad battery. So I hooked up the battery to the recharger, setting it to 10 amps with an automatic shutdown on full charge. An hour later, the recharger said the battery was ready. 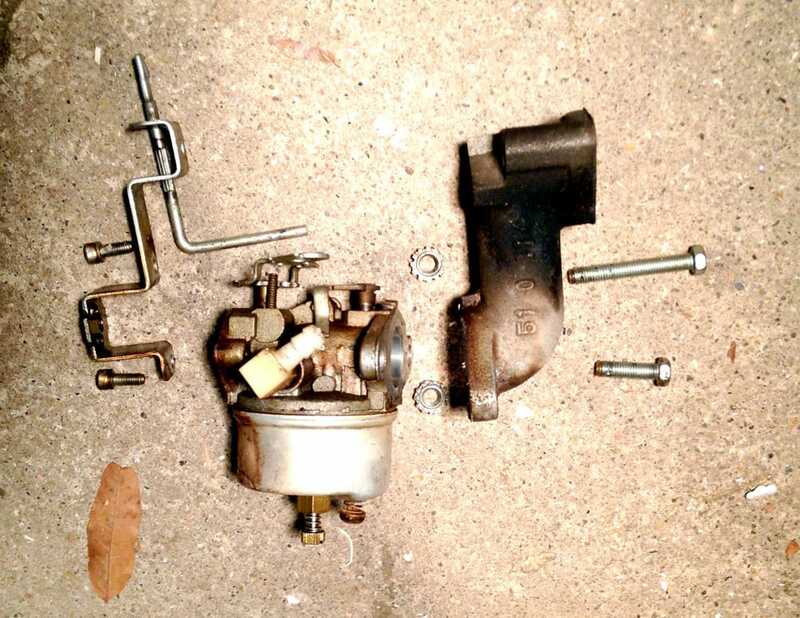 I hooked it back up to the mower and tried starting the engine. Still no luck. We did bring in my old battery to Lowes for recycling. They give you a small discount (which covered a core charge fee for a new battery purchase). 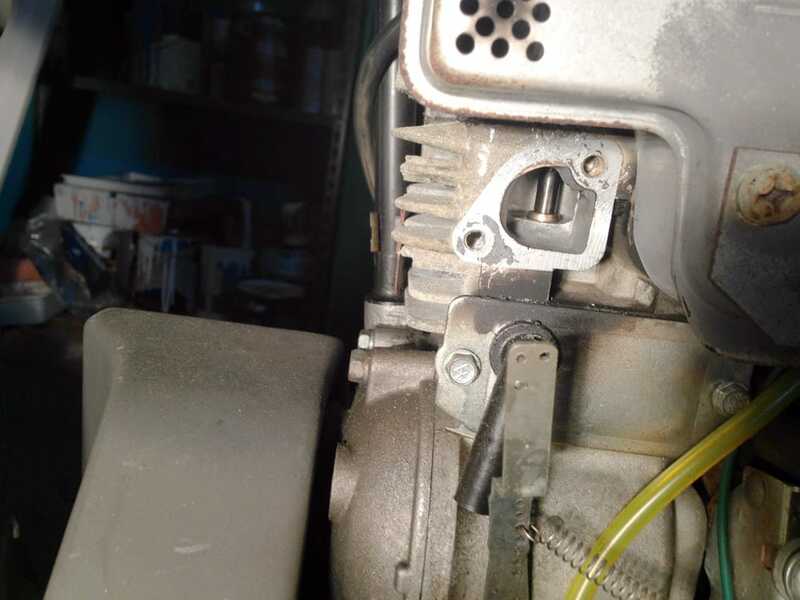 The starter motor did not hesitate at all. The flywheel immediately began spinning, trying to start the engine. It did take a few tries to get the engine running, but eventually got it going. That leads me to the next maintenance steps. Now it was time to change the oil and oil filter. I located the oil drain plug and setup a funnel and plastic container to collect the old oil. I then removed the oil dipstick from above, loosened the drain plug and out came the oil – pouring out slowly. When the oil stopped coming, I screwed back in the plug and went to work on the filter. I put a rag under the existing filter to catch any oil that would spill. I twisted the filter and pulled it out of the mower. Good thing I had the rag in place because a lot of oil came out of the filter. I grabbed the new oil filter, put a little oil on the gasket and screwed it into the mower. Now it was time to pour in new oil. I poured nearly two quarts of 5W30 oil (picked up at the nearby gas station) down the oil dipstick hole, pausing every now and then to take a measurement with the dipstick to make sure I didn’t overfill. Next up was the air filter and pre-cleaner. 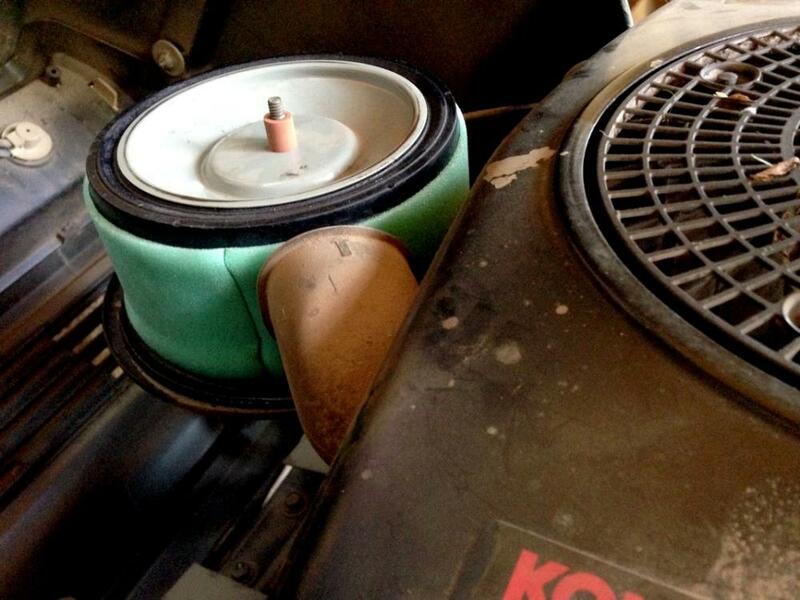 It’s important to have a steady flow of filtered air entering your engine. Disruptions to this flow can lead to lack of power, excessive fuel consumption or problems starting up. You can normally clean out the old filter, but I had no idea how long the existing one was in there. Therefore, I disposed of the old one and replaced with a new one. Accessing the filter was easy. I just removed a wing nut and the metal housing. The air filter itself is just a cylinder with wire mesh and a paper filter. The pre-cleaner is a piece of sponge wrapped around the filter. I unpacked the new pre-cleaner, and following the installation instructions. I moistened it with some motor oil and wrapped it around the new filter. 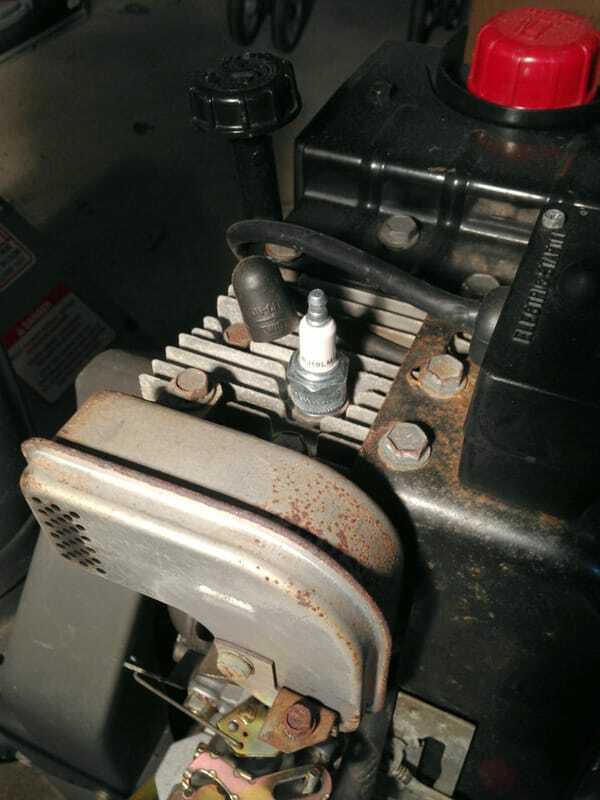 Then, I replaced the old one on the mower engine. Now for the fuel filter. 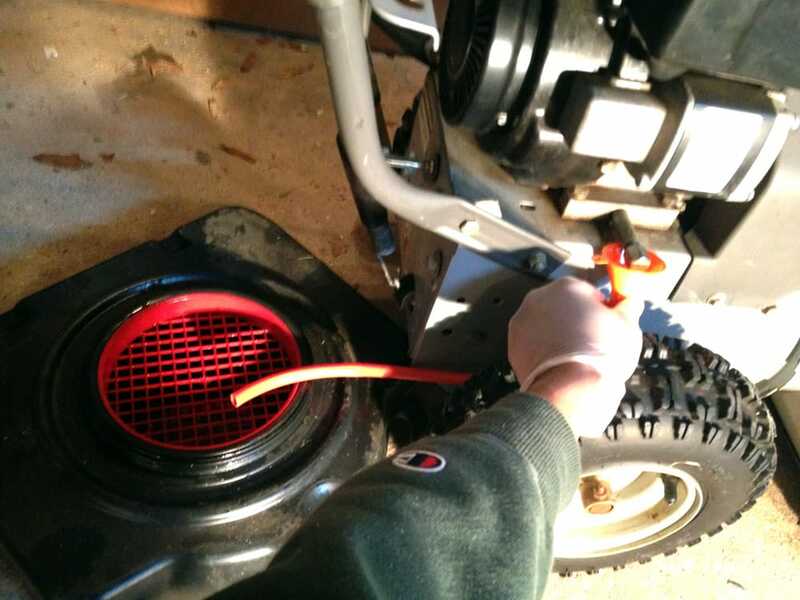 It’s recommended that you change the fuel filter on your mower once every season. 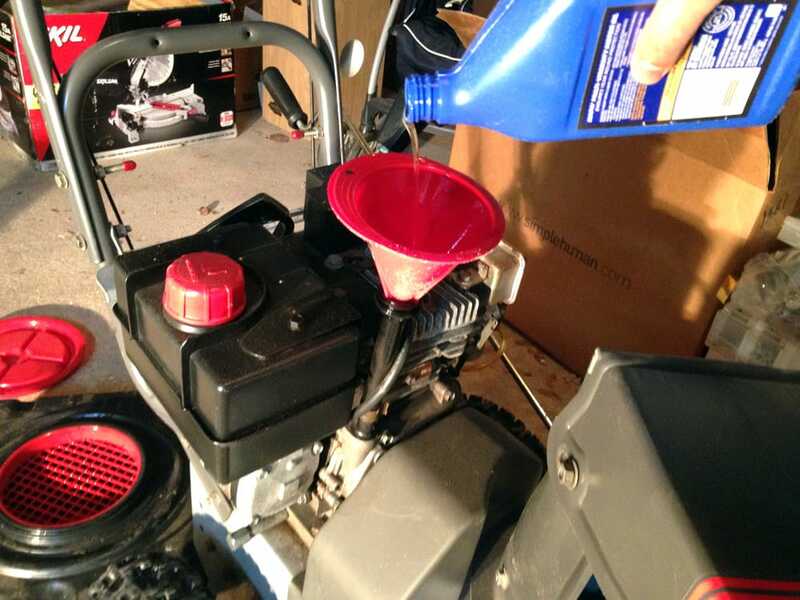 There can be lots of impurities in your gas tank (think about all the times you opened the tank lid for a refueling with grass still settling from the blades), so a season of mowing can clog up your filter. Using the mower manual, I located the filter on the engine. 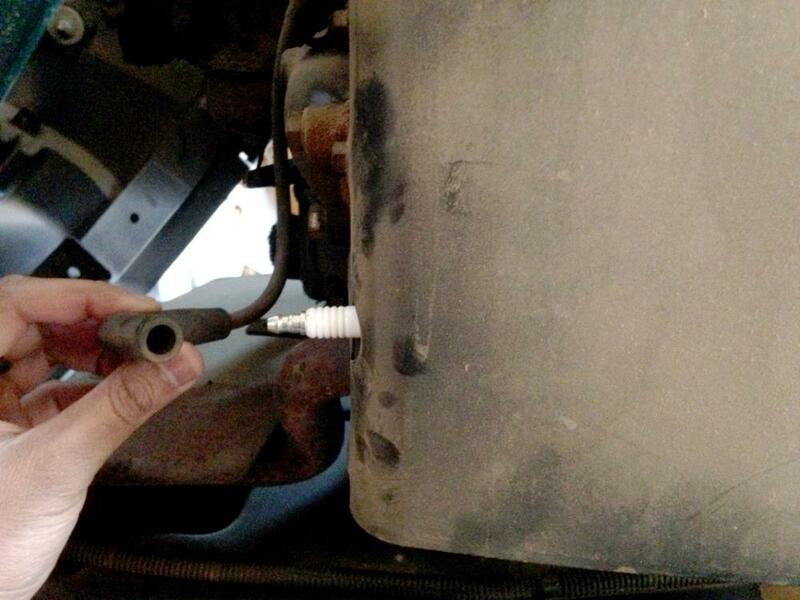 If you’re having trouble finding yours, just follow the fuel line from the gas tank to the engine. 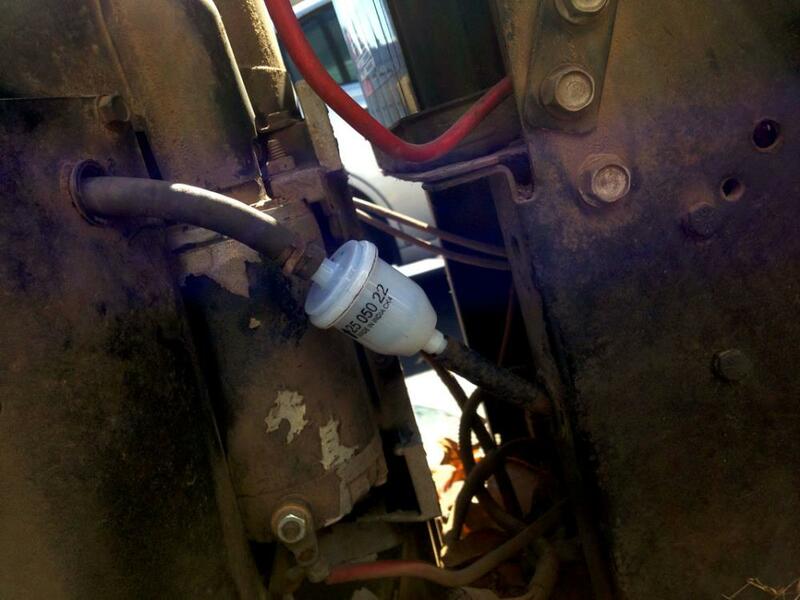 The fuel filter is along that line. 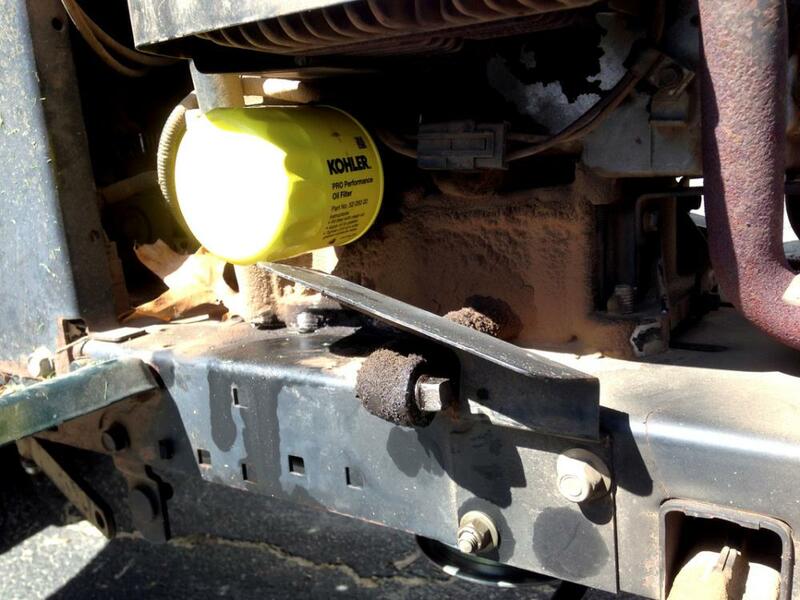 To remove the filter, I first clamped the fuel line in between the filter and the tank. I didn’t want fuel dumping out of the tank once I removed the filter. I also put a container beneath the filter to catch any excess gas stuck in the line and filter. 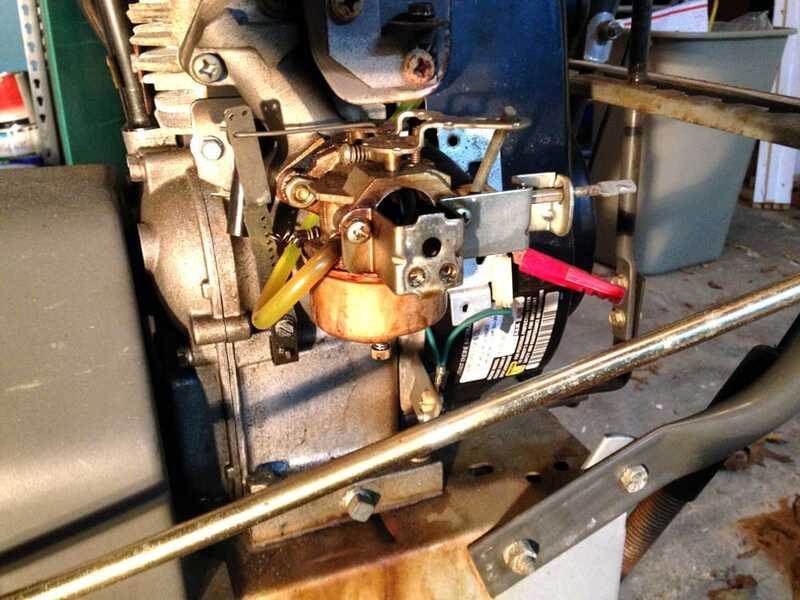 Then I removed the hose clamps holding the filter in place and pulled off the fuel line. Luckily no fuel leaked out. The tank must have been nearly empty. I then attached the new filter, making sure the arrow indicating direction of fuel pointed towards the engine. With the fuel lines clamped back onto the filter, I removed the temporary clamp pinching the line and installation was complete. At this point, the engine was now ready for the upcoming season. I turned the ignition key and the engine fired up without hesitation. I didn’t even have to apply the choke. Then, I let the engine idle for 10 minutes to make sure it ran okay and didn’t have any fuel or oil leaks. After, I took it for a test drive, and it drove like a champ. Now onto the mower deck, which was giving me some trouble. While mowing the front lawn, I noticed a lot of squealing noises coming from the belts in the deck. Also, the collection bags were barely filling with grass. It got so bad that I actually had to disconnect the automatic bagger because the tubes were getting clogged with grass. I switched to side discharge for the grass, which meant I spent a lot of time raking up the grass when done. Finally, a few times the engine actually died with the blades engaged. 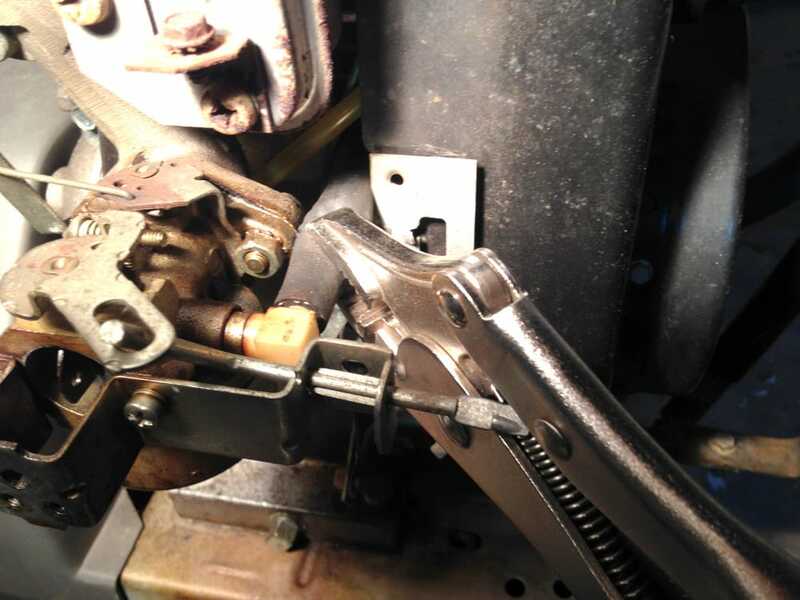 After inspecting the mower deck, I concluded that the three problems I had stemmed from a worn mower belt and debris wedging against the belts. 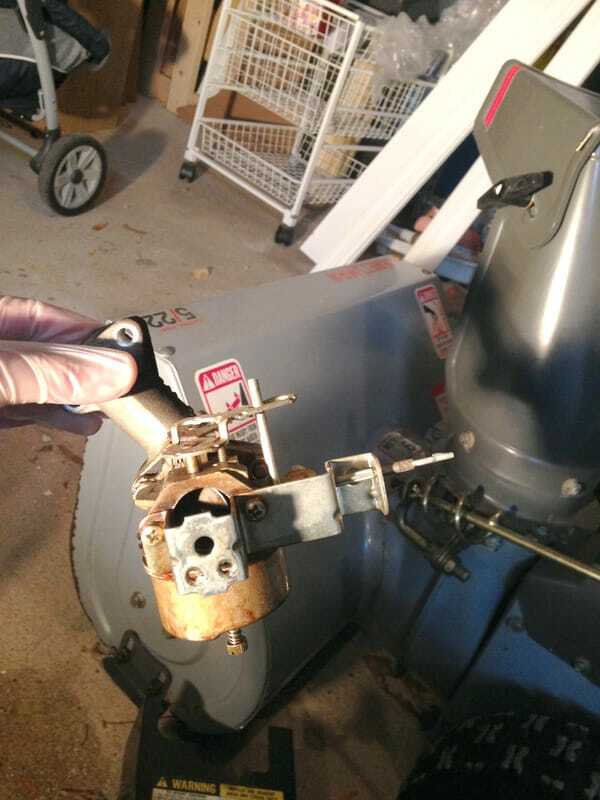 The debris particularly was causing a lot of friction with the belt and putting strain on the mower, causing the engine to stall out sometimes. 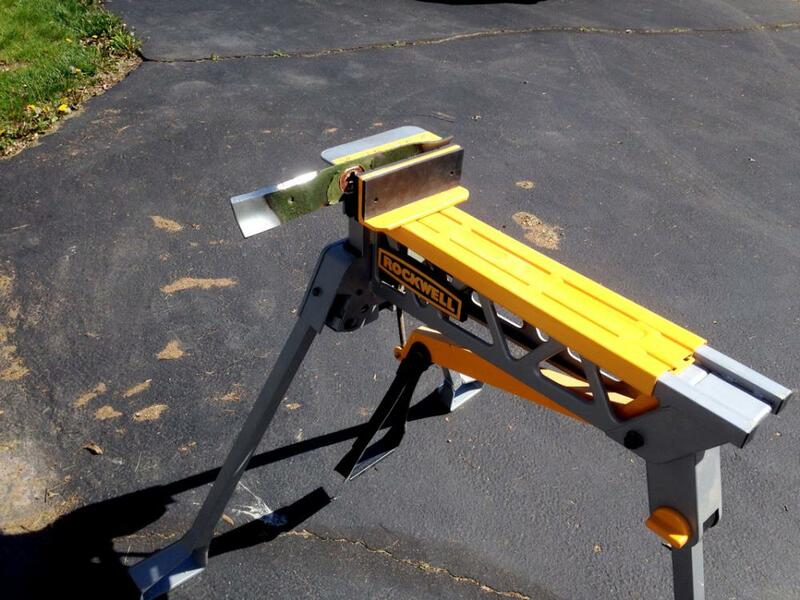 This also impacted the bagger because the blades could not spin at full speed and expel the grass fast enough. The belt also had clear evidence of being worn down. There were lots of cracks, and I was surprised the belt hadn’t broke already. 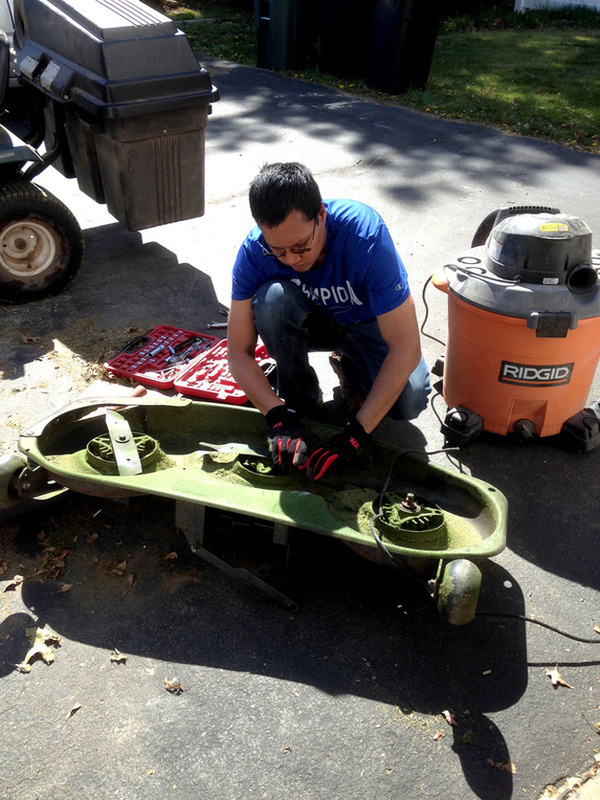 To address my mower deck issues, I first removed the deck from the mower. It was not that difficult. 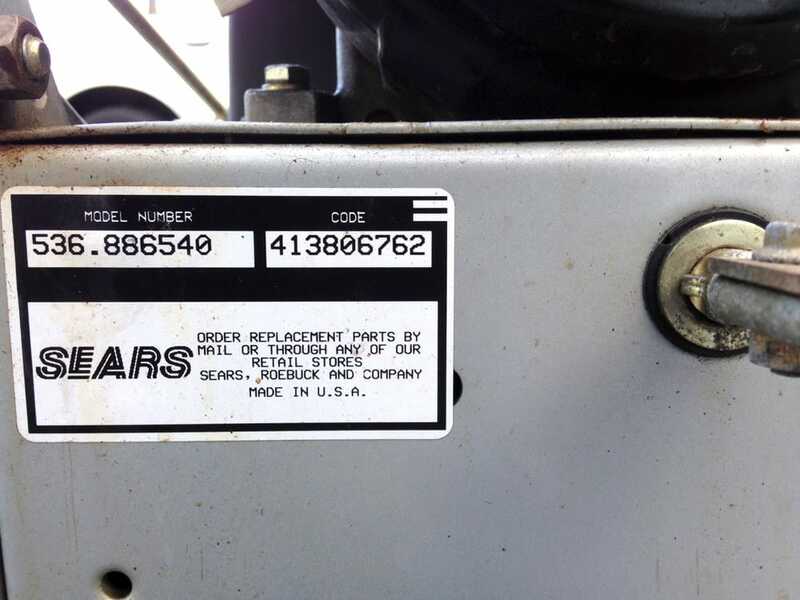 Following directions in the manual, I located and removed some retainer springs holding the deck pinned into the mower chassis. Then I slid the deck out from under the mower. Here is a picture of the deck removed from the mower. Technically I didn’t have to remove the mower deck to replace the belt. However the debris was really hard to reach and was easier to remove this way. I also wanted to take the opportunity to inspect the blades and underneath the deck. Once I opened the deck, I removed all the debris with ease. There was a lot of it too, from packed dirt to wads of dried leaves. I could see why the belts were making so much noise. I’m sure it was a fire hazard too, with friction from the belts heating up the dried leaves and possibly igniting them. Soon the deck was looking very clean. I flipped it over and inspected underneath. It wasn’t too bad under there. I just used a flat screwdriver to scrape off some grass patches that have been building up over time. When I checked out the blades, they were extremely dull. The sharp part was actually round and smooth. All this time mowing the lawn, I could have just whacked the grass with a baseball bat. So I removed the 3 blades with a socket spanner, clamped each one in place and sharpened with my Dremel and a grinding stone bit. After I sharpened both ends of the blade, I stuck a bolt in the blade to see if it was properly balanced. If either side of the blade dipped, it meant the blade was imbalanced and would cause a lot of vibration when spinning. Luckily, I did the job evenly when sharpening and the blades were balanced well. Now to address the worn out belt. I took a picture of the belt route with my phone and then removed it. I installed the new belt matching the route from my picture. Mower deck maintenance was now complete. 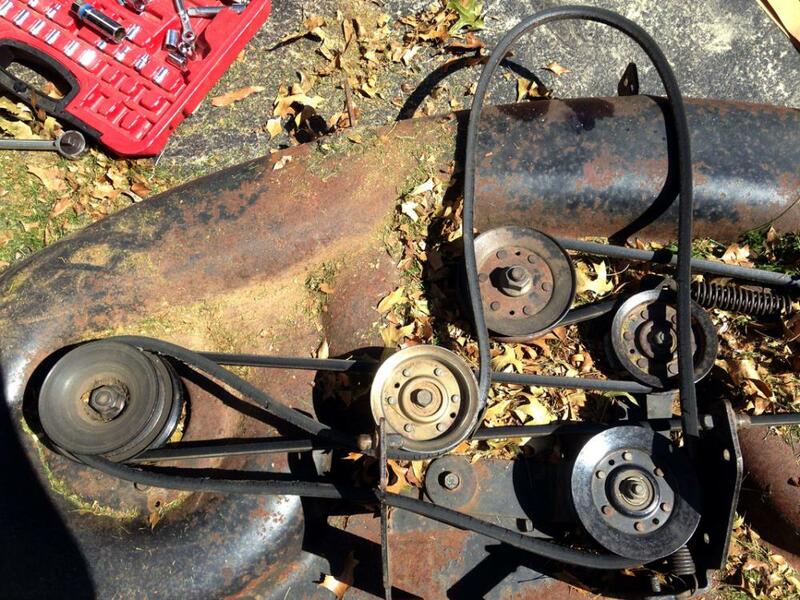 I slid it back under the mower and reattached the retainer springs to secure it to the chassis. I started up the motor and engaged the blades. Nothing happened. Oh no, what happened? The blades did not spin. I looked underneath the mower and discovered the belt had too much slack. I compared the new belt to the old one and saw that the new one was slightly bigger. Unfortunately, this model mower did not allow you to adjust the tension in the belts, so the new belt was unusable for me. I ordered the correct part number online, but it was a third party belt. I should have spent the extra money for a factory replacement instead. Disappointed, I put back in the old belt, so I could at least use the mower and ordered a factory belt in the meantime. I’d install it in a few days when it arrives. Let that be a lesson, be wary of third party replacements especially when the price looks too good to pass up. I had almost completed my maintenance plan. 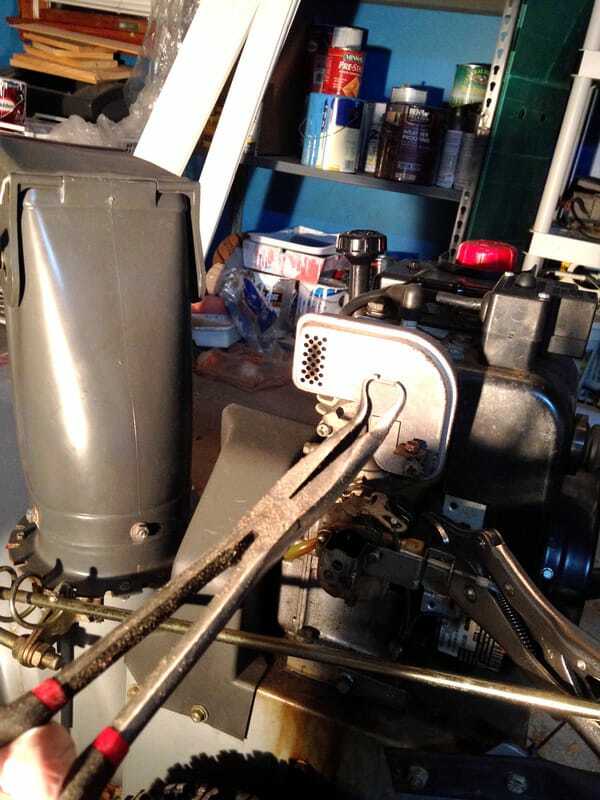 Then, I applied all-purpose grease to a few key areas on the mower. I used the mower manual to identify these areas, and applied grease where needed. A few areas also required silicone lubricant, which I was lucky enough to have a spray can of (I use it to keep my foosball table rods spinning like new). I broke in the new lubricated parts with a drive around the yard, making sure to turn the steering wheel a lot. The neighbors must have worried what state I was in zigzagging the mower across the yard! The final step was to check the tire pressure. I grabbed a pressure gauge from my car’s glove compartment box and compared the mower tire pressure to recommended specs in the manual. They were a little low, so I used a bicycle pump to bring them back up to the correct PSI. Low tire pressure will cause excess drag when driving, and consume more fuel, so it’s important to keep your tires properly inflated. Finally, the mower was in proper working condition for the new season. I documented what parts I replaced along with the date. This way I would remember for next season the parts I replaced. Not everything in my maintenance plan needs to be done every season. I just wanted to hit all my bases this one time, since I had no way of knowing what the previous owner did. 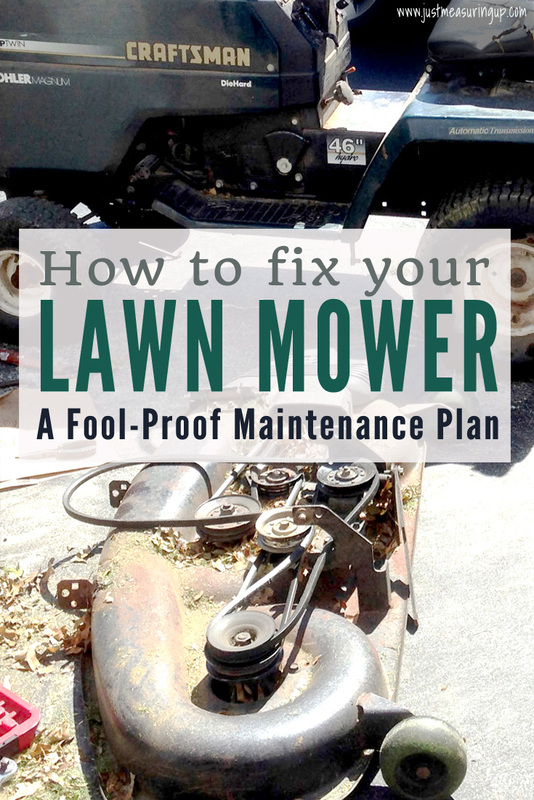 If you are in a similar position, wondering how to fix your old riding lawn mower, then go through the above checklist. It’s been tried and proven. Look out tall grass, I’m ready for you this season!